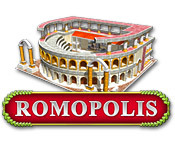 Romopolis is rated 4.5 out of 5 by 4. Rated 5 out of 5 by cianistarle from Love these types of games Not sure how I missed this one! 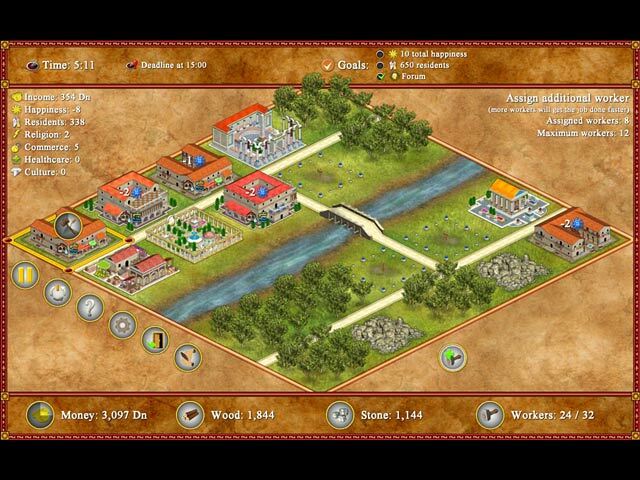 Good old school civilization/city building game. Nothing brilliant with the graphics, but the gameplay is fun. Reminds me of the old Cesar series. Have just completed the trial and purchased the game. I was distracted for much of that hour, but knew that I would be buying it within the first few minutes. Loved how you can chose the level of difficulty and also choose to have times or un-timed! Give it a try, I think you will have fun! Rated 5 out of 5 by Mom2MartyB from Very Neat Game I have to tell ya, I am really enjoying this game. I'm not finished and at least for me, it is a bit addicting. It's a challenge to get all that you need done, although I must say, since I play for relaxation, I did turn the timer off and that is one thing I like about the game, turn it off in the options...hint hint..:) over all, just a good time management/strategy game. Rated 4 out of 5 by skg122596 from ok, but not exactly my type I liked it but I didn't love it. Honestly, without seeing the walk throughs on line, I wouldn't have completed all the tasks in the given time. 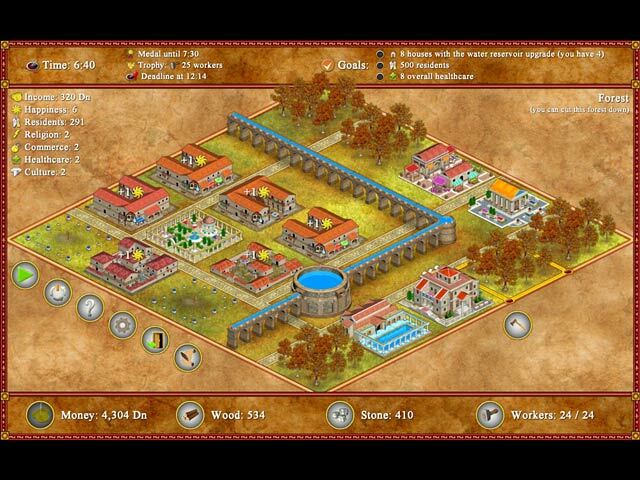 I finished the game without ever quite figuring out entirely how gardens and buildings strategically helped my cause. 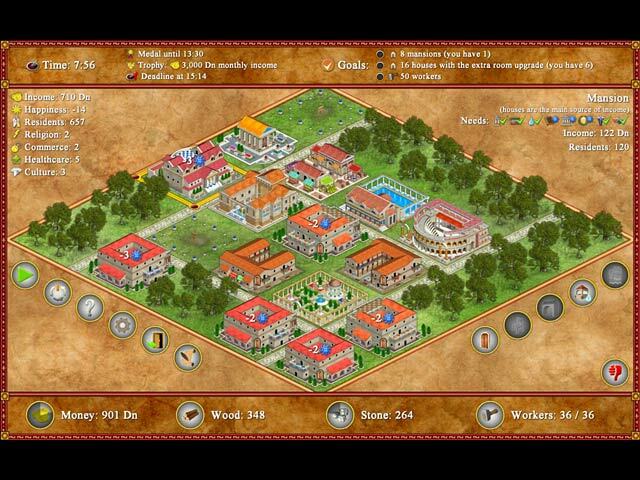 Rated 4 out of 5 by El_Cider from Okay, let's do it again I used to play Caesar and worked out the best ways to build good cities. Seeing a big city working was satisfying, but it took a lot of time. You don't have to worry about that with this game, at least, no where near as much. But there are things to do and not do. This game gives you a short time span in which to solve each layout - and doing that is a lot of fun; if you like logistical style puzzles. With the timer on you have a few minutes to sort out the design of your small 25 grid city. Sounds mundane, but it wasn't to me. Because each mini-game need only take a short amount of time to play the 'do it again' or 'do the next one' pull is high. In some respects this game lives somewhere between the city-builder, Ceasar, and sudoku: there's room for some creativity and ingenuity but there's also an underlying (mathematical) formula to design your cities by. The graphics are basic but they are designed to make the game function smoothly, which it does. Sounds are basic but enough, or can be dispensed with. I played through the game with the timer off, but the time still shows so you can still rate your skill - mine only became decent by the the last campaign and then because I discovered you could add more workers (a limited number) to build things faster - so I'll have to play it all again and beat that timer. Also there's always a bonus challenge in each campaign which nets you a trophy (same one every time) for completing it - this of course works against beating the campaign in the time allocated. If you play with the timer on and win within the time given you also win a medal. I realized if you take the challenges seriously you want to use the space bar a lot to pause and consider carefully what to build, what to buy, what land to clear, is it time to plant a garden or demolish a building; and in this the restart button gets its share of use. So there's an interesting mix of elements to evaluate. This, of course, becomes more intense as the game progresses. Ultimately, good choices and the right commitment of resources show 'timely' results. However, there is no save button, you either make it work, restart or fail (with the timer on), or take an unconscionable amount of time to get it right - which can be satisfying too. However, the lack of a save button just doesn't matter as completing each mini-game is something you should be able to do in 10 to 15 minutes (hahahaha). But there is one awful problem: as soon as you complete your city, by fulfilling the very specific goals for each campaign, a congratulatory banner slaps itself over your just completed masterpiece and denies you the option to sit and enjoy the satisfaction of your efforts! Definitely the cake without the icing - in the options there is nothing about banner removal. This led me to build almost everything that was supposed to be built so I could look at the finished visual product without the game ending - I know, could be thought of as weird, or creative but adds a new level of challenge! There is a sandbox mode which after using once you will never use again as the game works mainly because of the objectives for each scenario; sandbox lets you build a perfect city every time and ... well sandbox mode shows where the graphics have a very limited life. At first I thought this game would be pretty trite, maybe it is, but I found it very engaging and raced through the game to build a very fine city in the last campaign and in a timely manner. I'm new to BF but I play a lot of different games, more serious games perhaps, heaps from Steam, but this game delivered very nicely and is a keeper for me. I initially rated this as a 4 star game because it seems too simple, yet it challenges and engages effortlessly; so 4 and a half stars - and 5 stars if they just get rid of that stupid end scenario banner. I mean there's tiny streamers and cheering .... let me have the adulation!!! !